How many interns can say they helped manage a sales territory that generates over $7 million annually? 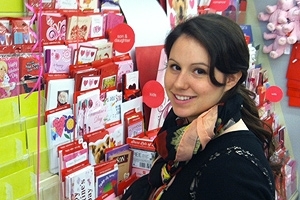 Thanks to her internship with American Greetings this spring, Rachel Rea, BSBA/BA '13, can. Rea is working alongside Jerry MacGillis, the company's area supervisor for Washington, D.C. and the surrounding area. Her hands-on experience involves managing more than 150 retail accounts, including supermarkets, mass channel, and drug stores to ensure their territory is generating revenue. The job is no cake walk: the Cleveland, Ohio-based company is the largest publicly-traded greeting card company in the world. Rea must develop and maintain relationships with store management; hire, train, and supervise a staff of 55 part-time merchandisers; and travel in- and outside the Beltway, visiting accounts to make sure everything is running smoothly. No two days are the same, said the Washington, D.C. native. "The American Greetings internship is easily the most hands-on and intensive internship I've ever had," she said. "It's an excellent opportunity to learn from top-of-the-line management professionals about leading a team, efficient planning, and interpreting sales reports to improve team performance." Beyond gaining experience in field sales management, Rea has the opportunity to connect with other interns and executives at American Greetings. Each week she participates in the team’s LinkedIn group, which includes all of the interns, trainers, district managers, and even the vice president of field sales. "I've sharpened my analytical skills and my professional communication," she said. "I recommend [the internship] to anyone interested in sales or management." The internship program launched in 2012 and actively recruits business students. American Greetings generates annual revenue of approximately $1.6 billion; the Cleveland, Ohio-based company's major greeting card lines are American Greetings, Carlton Cards, Gibson, Recycled Paper Greetings, and Papyrus. Rea will graduate in May with two degrees: a BS in Business Administration (BSBA) with a specialization in Entrepreneurship, and a BA in Broadcast Journalism from the School of Communication.